Could the Oracle of Omaha have made a mistake? All people are subject to biases that influence the way we see and interpret information. These biases tend to be deeply rooted in our experiences, and are usually very helpful in making effective decisions. As researchers we have found that often top executives are particularly subject to such cognitive biases. Very powerful CEOs are especially vulnerable as their judgment has served them well through the years. The issue in the Lubrizol situation is probably not that Warren Buffet intentionally white-washed the insider trading situation to his shareholders – it is more likely that he has been viewing the situation through the lens of his experiences – which tells him that David Sokol would not engage in such behavior. Several specific biases could be at work. As David Sokol is a lot like Warren Buffett – also born and raised in Omaha, wealthy, successful, and generally conservative with Midwestern values – he may be subject to a type of similarity or projection bias in which Mr. Buffett projects his own extremely strong personal values onto David Sokol. Mr. Buffett may also be subject to a halo effect bias in which Mr. Sokol’s business values and success in other areas are falsely believed to extend into his personal values. In each of these situations, a CEO is probably not aware of how their experience is blinding them, or leading them to selectively perceive certain information as more important than other information. The truth is that at this point we really do not know what really happened with these Lubrizol shares. A federal investigation and lawsuits from shareholders will sort out the facts. The simple point is this – sometimes we see what we expect to see, or what we want to see, at times projecting our own values onto those we trust. Warren Buffett has made a career out of poring over data but ultimately trusting his instincts. It may be that the shroud of his experience – clouded by key cognitive biases – has finally led him astray. CEO pay is a very complex issue that involves a lot of tradeoffs. Ford‘s Alan Mulally represents a particularly interesting situation – he is among the absolute best executives in the world right now. 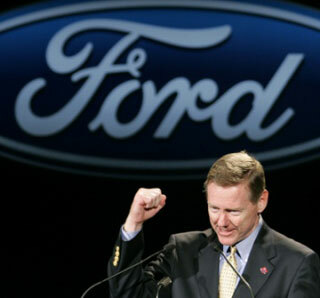 In the last few years his work at Ford has been truly remarkable by nearly any metric. Further, he took an incredibly difficult job (Ford was behind when he took over and was falling fast), and he was soon faced with the most turbulent competitive landscape the automotive industry has seen in the last 50 years. Both of his primary American competitors went bankrupt. Yet through this fire, he skillfully led Ford through tremendous changes and has the company incredibly well positioned to be exceptional for the next few years – even ranked as a more attractive stock than Apple by CNNMoney readers. This is what makes the issue so difficult. Does this tremendously successful CEO deserve a big paycheck? Absolutely. Does he deserve a $55 million dollar paycheck? That is the real question. The head of the UAW, Bob King, made this distinction very clear, which highlights the moral center of this debate. He specifically said that he does not think “any human being in the world” deserves that much money. This raises questions that business schools, boards of directors, and society at large need to contend with – do we believe that epically-large pay packages are morally responsible? Everyone agrees that long-term oriented pay packages are ideal for CEOs, as they help to solve the agency problem inherent in large public organizations by effectively aligning the CEOs interests with the interests of shareholders. However, the academic literature has shown that long-term contingent pay can be effective even if it does not involve incredibly large absolute dollar amounts. With this in mind, Bob King may be right – enormous pay packages might not be morally right. But I can assure you that until CEO labor markets adjust to bring down these huge pay packages, the best people (Alan Mulally included) will be tempted to go to organizations where they can get the best rewards for their talent. I think this is where Notre Dame has the opportunity, and maybe the responsibility, to be a voice at the center of the debate. Given our vision to help corporate America have the courage to Ask More of Business, we need to help influence leaders and especially boards of directors to make more responsible decisions that embrace long-term contingent pay without falling victim to the easy way out of rewarding great leaders with exorbitant packages just because they feel like everyone else is doing so. Further, market leaders like Ford could use this as a ‘teachable moment’ to show their peers that truly amazing talent can be fairly compensated with large but not excessive pay packages even in the face of epic leadership we might be able to get closer to making this a reality. For more, also see the press release ﻿Notre Dame put together about my comments: ND Expert. I also had the opportunity to speak with Jack Nerad on his nationally syndicated radio show about these issues more broadly. The interview should be airing in the next few weeks: America on the Road. I’m always interested in the guy-behind-the-guy. Despite our tendency to lionize the individuals who do great things in this world, often those who reach great heights are propelled in part by some interesting people who stay behind the curtains. Sometimes these people are spouses with great support, ideas, or encouragement. Sometimes they are mentors who have seen their day come and go and later find their greatest fulfillment in pressing a new hero into service or greater heights. Sometimes the ‘man behind the curtain’ is a benefactor. Dr. Paul Farmer is a truly great man. Even among those who have a life’s ambition to help the poor or serve the vulnerable, Dr. Farmer sets a high bar. His work, now known as Partners in Health, embodies the essence of transformational service and is rooted in a service to some of the poorest and most vulnerable people on Earth, in rural Haiti. Much has been written about the greatness of Paul Farmer, most notably in the incredibly well reviewed book “Mountains beyond Mountains” by Tracy Kidder. This work and others attest to the great story of how a kid from Florida who was about to start at Harvard Medical School begged, borrowed, and stole whatever he could to help a people who the rest of the world seemed to have forgotten about. He built clinics, brought resources, directed the attention of institutions (the World Health Organization and Harvard Medical School among others), and changed the way modern medicine was delivered to those he served. By learning about the people he served and the lives they lived, not just their medical problems, Dr. Farmer achieved incredible results and changed medicine. I wonder who else is back there, behind all those curtains. As it is presentation season at Notre Dame, I’ve had a few recent requests from students for my “tips on making your presentation awesome” guide. So, I thought I’d post this here and share it with everyone. None of this is rocket science, but I’ve found that just thinking through some or all of these points in the build up of preparing for a presentation can be a helpful refresher and get a group talking about things that they can do to be more persuasive in their presentation. The key, for me, is to think of a presentation as a conversation in which you are trying to persuade someone to believe in your ideas. The list below is an aggregation of ideas I’ve shared with groups through the years after watching and grading hundreds of group presentations on a wide variety of different topics in business classes at Notre Dame and Michigan State over the last 7 years. I hope this helps! Use embedded pictures and stories to stoke interest in your ideas, making your ideas come to life with tangible or funny examples that illustrate your points. Pay attention to eye contact (this doesn’t mean perfect eye contact, just a consistent engagement with the audience, very limited reading from notes / slides). Pay attention to transitions between speakers (smooth, graceful handoffs between collaborators working together who know each other and are working toward a common goal, not abrupt starts and stops of modularity). Pay attention to cadence (both within and between speakers!). Pay attention to volume (we need to be able to hear you, but don’t yell at us). Pay attention to your introduction (short, sweet, professional). Pay attention to your conclusion (sum up your best stuff simply and persuasively). Think about your presentation as a multi-media experience (it is always nice to engage the audience through multiple media devices, such as lecture, slides, handouts, video, audio, etc. This doesn’t mean that you should try to do everything, just a keep these things in mind to make your presentation as engaging as is appropriate). Pay attention to professional appearance as part of the charm and polish of your presentation. Try to be engaging, as audience engagement always matters. Avoid fidgeting too much, but moving around a bit can be good. Avoid talking to other group members behind the speaker as much as possible. Smile. Be funny if you can, but don’t be obscene. Be persuasive! In the reality of the professional world, the simple truth is that presentation effectiveness is always a function of both style and substance. I want you to be great professionals, so I’ll be grading you on both. Teams are often great at critiquing each other’s written work but don’t even think about each other’s presentation prowess. Break the ice. Take this list and talk it over as a group. The following list comes from Robert Sternberg, a Yale PhD and professor, who is one of the world’s leading authorities on human intelligence. The actual list comes from the website of Michael Anissimov a science/technology writer and blogger who blogs on issues of transhumanism, AI, and other topics. It is a fantastic collection of ideas from Sternberg on the paths to failure taken by otherwise very intelligent people. Some of this comes off as ‘obvious’ but collectively the list is very insightful. Enjoy. Content from Sternberg, R. (1994). In search of the human mind. New York: Harcourt Brace. Click here to buy the book through Amazon. 2. Lack of impulse control. Habitual impulsiveness gets in the way of optimal performance. Some people do not bring their full intellectual resources to bear on a problem but go with the first solution that pops into their heads. 3. Lack of perseverance and perseveration. Some people give up too easily, while others are unable to stop even when the quest will clearly be fruitless. 4. Using the wrong abilities. People may not be using the right abilities for the tasks in which they are engaged. 5. Inability to translate thought into action. Some people seem buried in thought. They have good ideas but rarely seem able to do anything about them. 6. Lack of product orientation. Some people seem more concerned about the process than the result of activity. 7. Inability to complete tasks. For some people nothing ever draws to a close. Perhaps it’s fear of what they would do next or fear of becoming hopelessly enmeshed in detail. 8. Failure to initiate. Still others are unwilling or unable to initiate a project. It may be indecision or fear of commitment. 9. Fear of failure. People may not reach peak performance because they avoid the really important challenges in life. 10. Procrastination. Some people are unable to act without pressure. They may also look for little things to do in order to put off the big ones. 11. Misattribution of blame. Some people always blame themselves for even the slightest mishap. Some always blame others. 12. Excessive self-pity. Some people spend more time feeling sorry for themselves than expending the effort necessary to overcome the problem. 13. Excessive dependency. Some people expect others to do for them what they ought to be doing themselves. 14. Wallowing in personal difficulties. Some people let their personal difficulties interfere grossly with their work. During the course of life, one can expect some real joys and some real sorrows. Maintaining a proper perspective is often difficult. 15. Distractibility and lack of concentration. Even some very intelligent people have very short attention spans. 16. Spreading oneself too think or too thick. Undertaking too many activities may result in none being completed on time. Undertaking too few can also result in missed opportunities and reduced levels of accomplishment. 17. Inability to delay gratification. Some people reward themselves and are rewarded by others for finishing small tasks, while avoiding bigger tasks that would earn them larger rewards. 18. Inability to see the forest for the trees. Some people become obsessed with details and are either unwilling or unable to see or deal with the larger picture in the projects they undertake. 19. Lack of balance between critical, analytical thinking and creative, synthetic thinking. It is important for people to learn what kind of thinking is expected of them in each situation. 20. Too little or too much self-confidence. Lack of self-confidence can gnaw away at a person’s ability to get things done and become a self-fulfilling prophecy. Conversely, individuals with too much self-confidence may not know when to admit they are wrong or in need of self-improvement.